I bought this antique bed footboard at an auction last week and decided to turn it into a coat rack. Here’s how it turned out. I’m absolutely in love with it! The details on it are gorgeous, so it just needed to be painted and given light distressing. I would love to have kept it, but since I don’t have a place for it right now, I listed it in my Etsy shop, and it sold quickly. 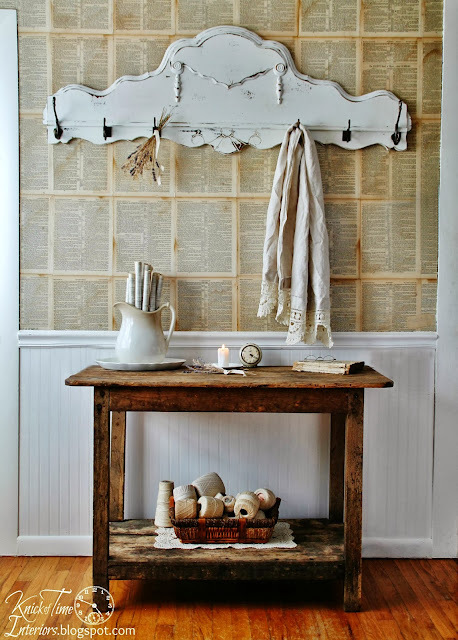 Whenever we get our bedroom remodeled, I hope to come across another beautiful old headboard or footboard, and make a coat rack like this for myself. That is lovely, Angie! The paint brought out the beauty! Very pretty as a coat rack. I do wish you lived nearby – I have a stack of headboards and footboards waiting for their makeovers. I need some motivation. Your project does inspire me. I love the transformation and I’m sure it won’t last long in your shop. Keeping everyone in the wake of these storms in our prayers. I am praying for those effected by these terrible storms. So much devastation. I am glad your friend is safe. The footboard coat rack turned out beautifully! That turned out absolutely lovely! Those storms are so typical of what happens here in Oklahoma and so I am well aware of the devastation that comes. Sadly, it does take months and months for a community to recuperate and “get back to normal”. My heart goes out to those who have been so tragically affected. Thankfully, your cousin and her family were safe…and you as well. Love the coat rack! Sorry about what your cousin has been through. Thankful that she is safe though. My brother lives in the area hit by these storms, but was lucky to have no damage. I hope they all can recover as quickly as possible.